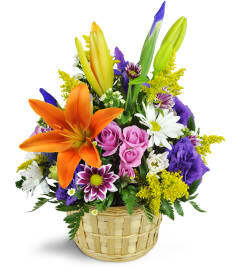 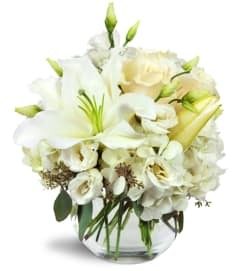 An elegant display of faith and divine peace, this beautiful arrangement will comfort the bereaved in a truly thoughtful and respectful way. An exquisite crystal cross is surrounded by a bed of lovely blossoms. 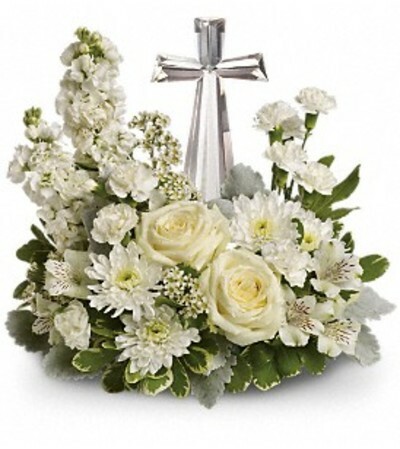 It is sure to be appreciated and always remembered.A fragrant mix of pure white blooms - including roses, alstroemeria, stock, carnations and waxflower - is accented with dusty miller and variegated pittosporum around an exclusive Crystal Cross keepsake.